The recent EKOS poll is bad news for Justin Trudeau and the Liberal Party of Canada. Among the three major federal parties, EKOS has the NDP at 31.3%, followed by the Conservatives at 29.2% and the Liberals bringing up the rear with 23.9%. Significantly, the poll shows that the Conservatives and Liberals are struggling with both “ceiling” and leadership numbers. Only 6.7% pick the Conservatives as a second choice, putting their growth ceiling at 35.9%. For the Liberals, 18.8% see them as a viable second option, for a total upside of 42.7%. The NDP’s numbers here are truly impressive: 19.9% see them as a viable second choice, for a total of 51.2%. And when it comes to leadership, Mulcair’s approval ratings, at 60%, far outshine Trudeau’s at 46% and Harper’s dismal 32%. The negatives are interesting, too. 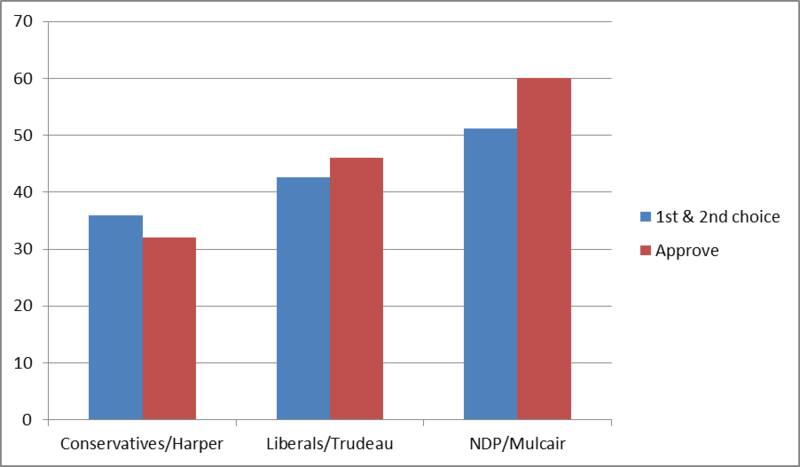 Harper has a 62% disapproval rating, Trudeau is at 47%, and Mulcair is only at 30%. What’s going on? Clearly, the Trudeau honeymoon is over, and it isn’t just a fickle electorate: he only has himself to blame. This is a man who acts before he thinks, then hunkers down. He made a purely poll-based decision to support Bill C-51, and then incorrectly raised concerns based exclusively on the lack of oversight. In fact, there is plenty else wrong with the flimsy, ill-defined bill, from giving CSIS policing powers to far-reaching information gathering and sharing (Health Canada, CRA, etc.). Then there is the Truth and Reconciliation Commission report. Trudeau came straight out and said that, as Prime Minister, his government would implement all of the almost 100 recommendations. This is naïveté, stupidity, or mendacity. Take your pick. These miss-steps fall on the heels of a rigged nomination process that has proven Mr. Trudeau to be capable of the strong arm and manipulative political tactics of his forefathers in the Liberal Party. Parties don’t have to promise open nominations – in many ways it makes sense not to – but Trudeau did, then proceeded to rag the puck. The list of favored candidates who have benefited by his meddling is long: Adam Vaughan, Bill Blair, Eve Adams, Andrew Leslie, Chrystia Freeland, and Melanie Joly (to name a few). This, after whipping his caucus to vote for the bill. Does he really think the Canadian electorate thinks he deserves to be given that authority? On what basis? Yes. I too have lost confidence. I'm with Tom.